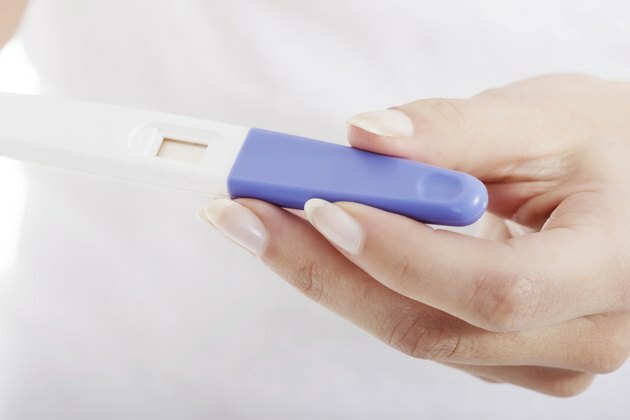 It's not possible to tell whether you're pregnant immediately after ovulation. In fact, the embryo doesn't even begin to implant into the lining of the uterus until about 6 days after the egg is fertilized. Only after implantation does your body produce the hormones that cause early pregnancy symptoms. If you're very observant, you might notice symptoms around the time of your first missed menstrual period, at approximately 2 weeks after ovulation. At this time, you might also have a positive blood or urine pregnancy test. Pregnancy tests can, in most cases, confirm a pregnancy around the time you miss your first period. These tests measure human chorionic gonadotropin -- commonly known by its abbreviation hCG -- which is a hormone produced by the placenta as it develops. While hCG levels are usually negligible when you're not pregnant, your levels rise quickly, doubling every couple days in early pregnancy. An over-the-counter pregnancy test will tell you whether or not your urine contains a detectable amount of hCG. A blood test, on the other hand, will indicate the exact amount of hCG in your blood. An ultrasound can detect a pregnancy as early as 4 to 5 weeks after your last menstrual period. A transvaginal ultrasound will give a clearer view than an abdominal ultrasound at this early date. The earliest sign of a pregnancy is a tiny sac in the uterus, which may be seen as early as 4 weeks after your last period. By 5 weeks, a transvaginal ultrasound will often show a gestational sac -- a fluid-filled area surrounding the fetus -- and a yolk sac -- the initial source of nutrition for the fetus. By 6 weeks after your last period, a transvaginal ultrasound can give the earliest view of the fetus, including his or her heart beat. While missing your period is often a sign of a pregnancy, a missed period can sometimes be due to other causes, such as stress or certain medical conditions. Your age can also affect your menses. Adolescents and women older than age 40 often experience irregular or missed periods. Anorexia, changes in weight and certain medications can also cause delayed or skipped periods. To further complicate matters, you may experience some bleeding around the time of your expected period even if you're pregnant. With all these factors in play, a missed period or the presence of bleeding is not enough to let you know for certain whether or not you're pregnant. If you're unsure about being pregnant, check with your doctor. Some symptoms of pregnancy can occur soon after you miss a period. Nausea and vomiting, which most pregnant women will experience to some degree, can occur as early as the time of your first missed period. Breast tenderness and tingling can start as early as your first missed period as well. Other symptoms, such as breast enlargement and urinary frequency, won't begin until at least a couple weeks later.